It's not that Epping haven't been doing anything over the last couple of months, it's just that I haven't been organised enough to write some words and sort through photos. And I apologise for failing to get any photos of the two wonderful baby blankets that Eleanor showed us as part of her demonstration of machine knitting. 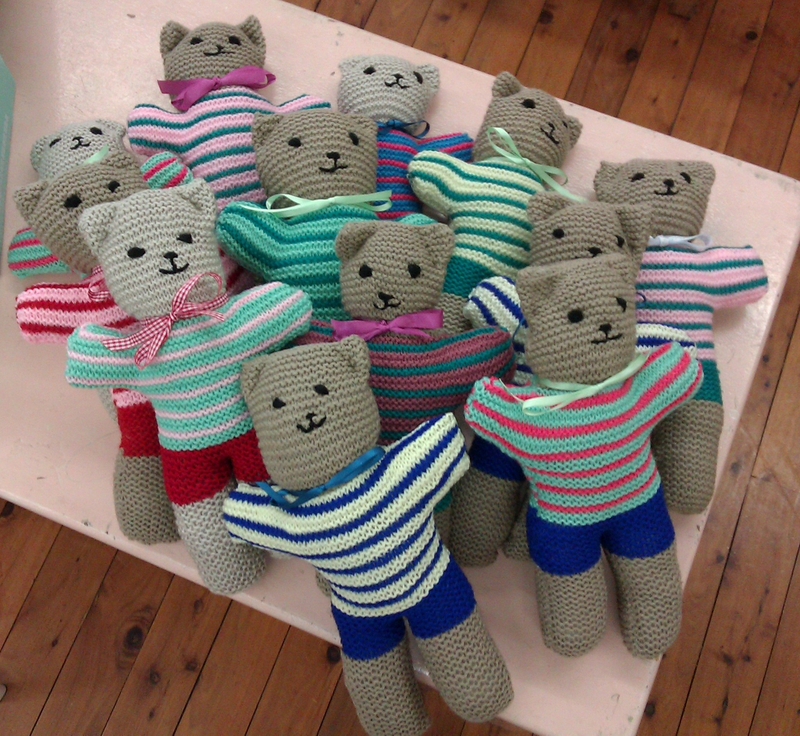 Many thanks to Jacqui for all her teddies - below are the teddies we received from Jacqui in October and December. 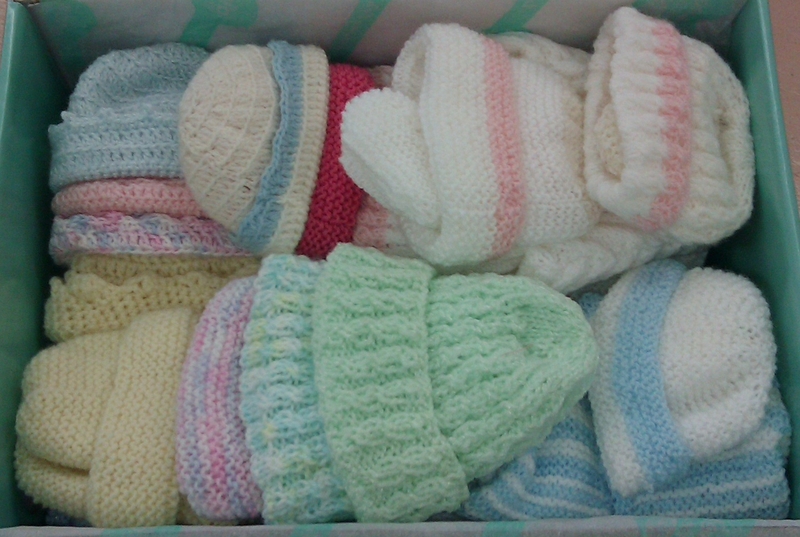 Along with a box of delightful premie baby hats, booties and jackets made by Thelma. 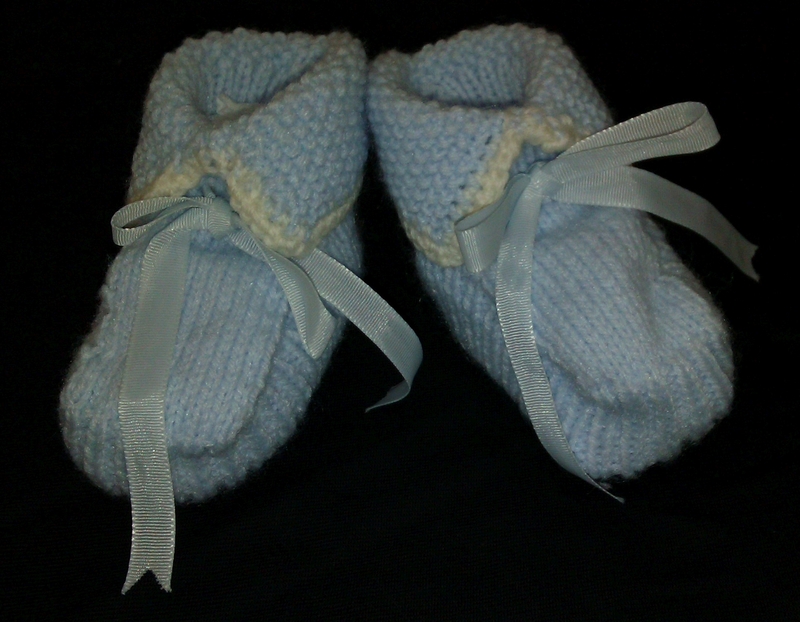 Janet, a new member at Epping, made these delightful pale blue booties - her first pair. I'm sorry I don't know who made the other set of three booties, but thank you for them. 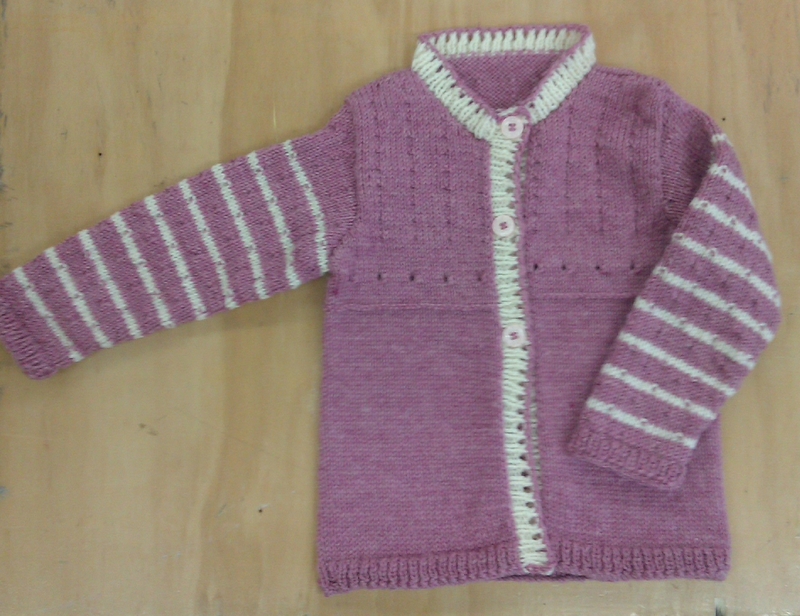 - Stasia has made another cardigan for her granddaughter. Stasia's grandchildren are the recipientsof many delightful cardigans. 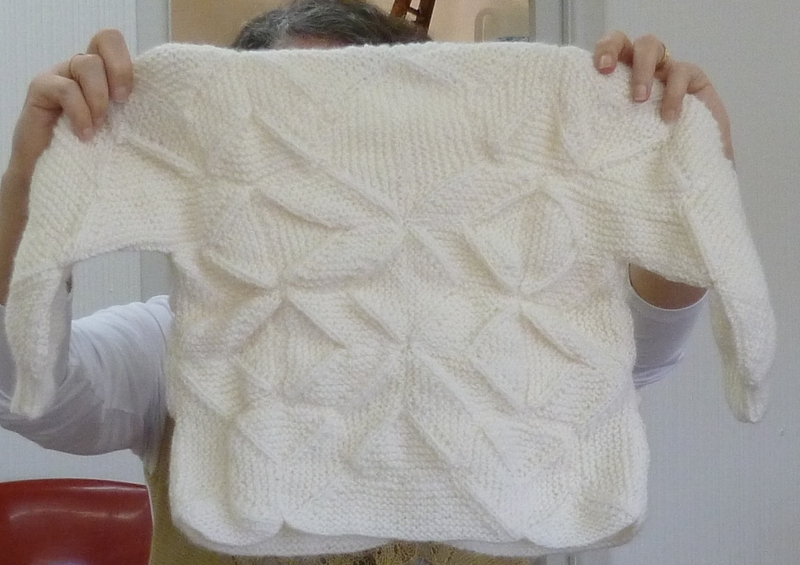 - Hazel has finished her "Catherine Parr" jumper from Alice Starmore's book Tudor Rose. It's beautiful Hazel. all we need now is cold weather so that you can wear it! - Maria has incorporated a number of techniques taught on our education days through out the year. 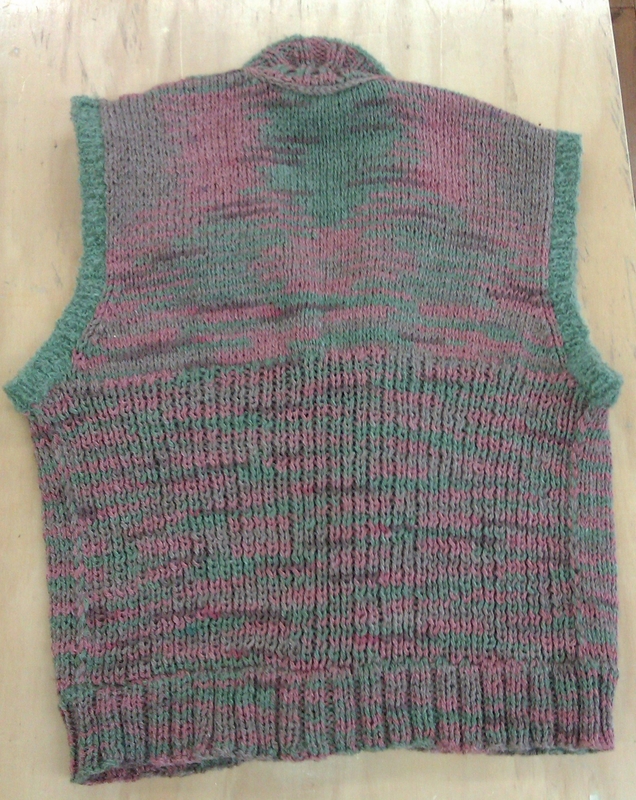 She has used the German short-row shaping for the shoulders and collar, and added an I-cord edging. - Diane had caught the lace bug! She has discovered the delight in making light, lacy scarves. We look forward to her next creation. 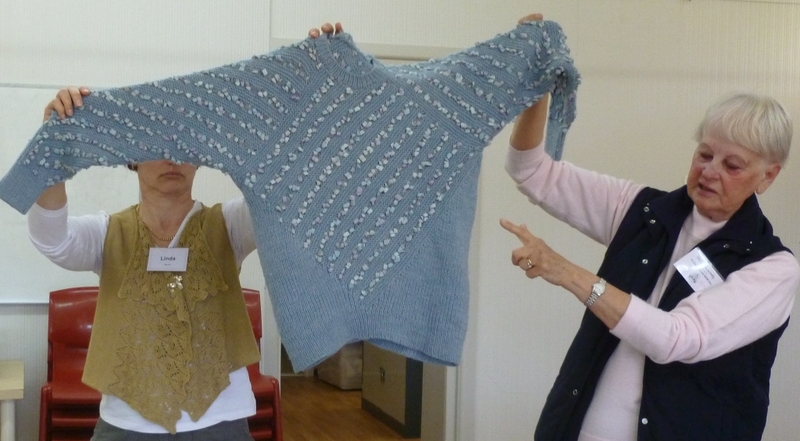 - Jill has made a lovely cape with, I think, yarn that she has spun. That is real dedication to creating a garment. 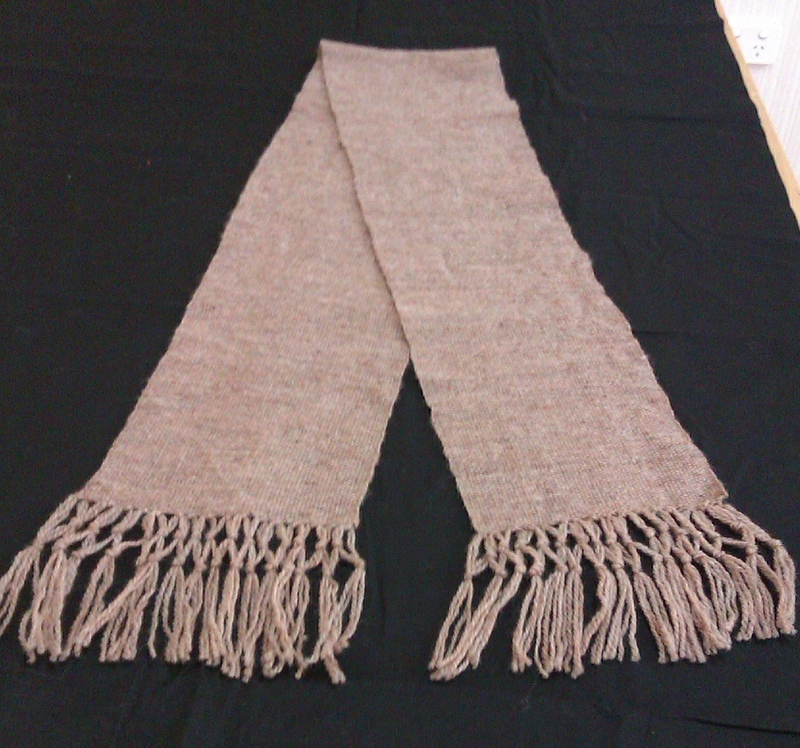 - Brenda made this scarf on the knitting loom, and she's going to show us how early next year. I think this will be on the education day in February, so keep an eye on our calendar. - Sue has made this delightful wrap using the Orenburg honeycomb lace stitch - which is reversible. And I love the colours! 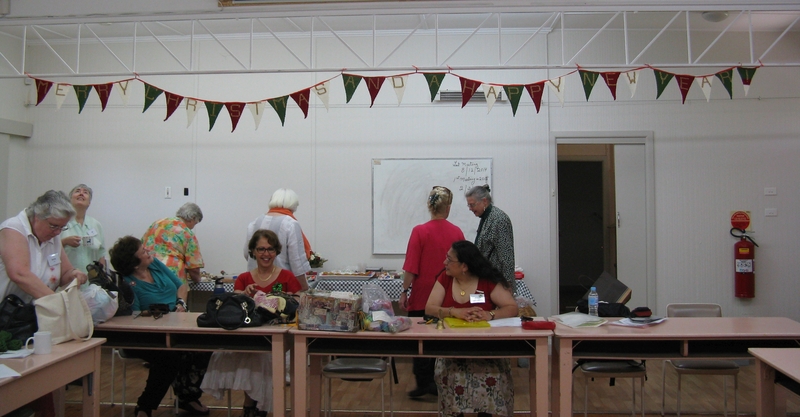 Some of the Epping knitting group also go the the Epping crochet group, so we get to see crochet show-and-tell too. Here is a small sample of some of the crochet items shown recently. 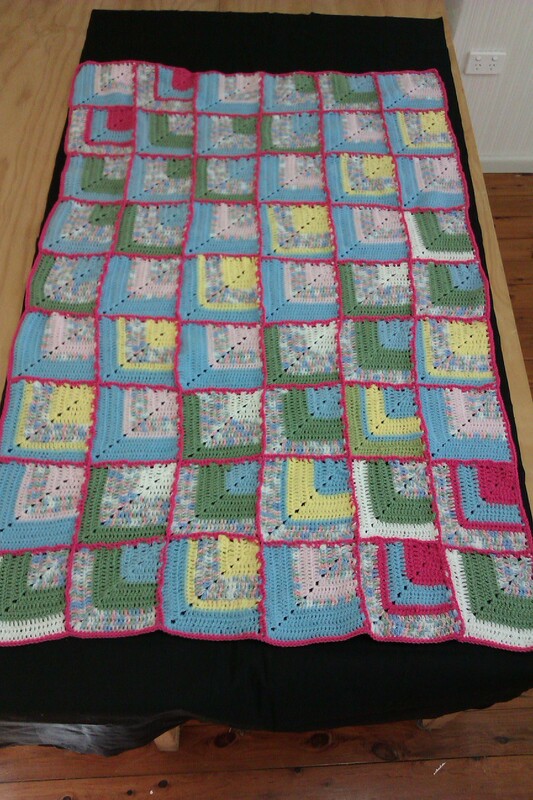 The blanket was made by the crochet group from yarn given to the Guild, and will now be donated to charity. 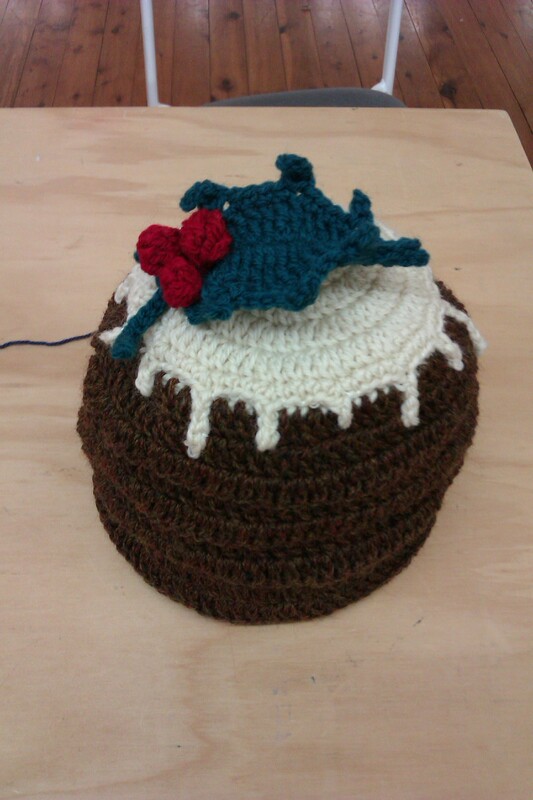 Not only are the ladies at Epping talented knitters and crocheters, but they are also talented cooks. 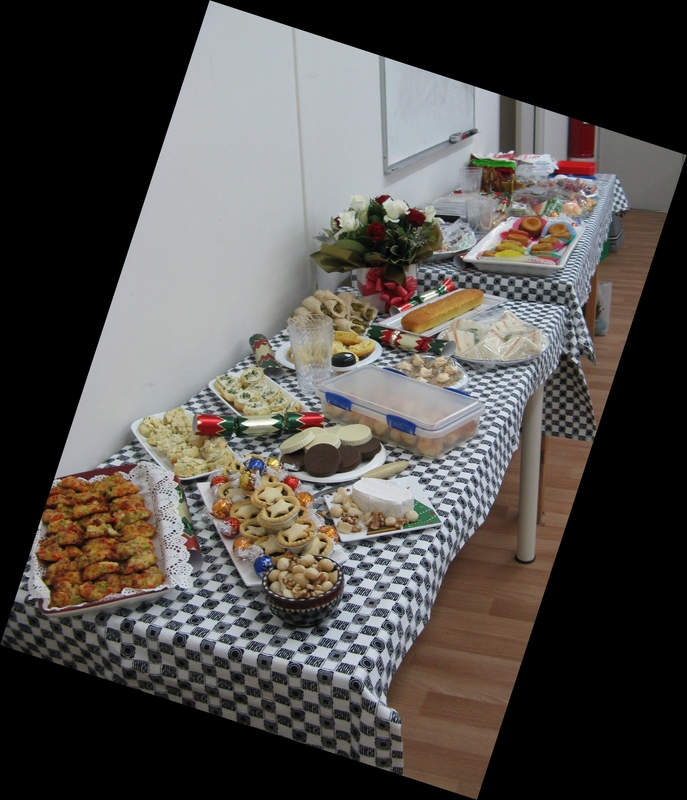 This is always quite evident at our Christmas celebration where we had a veritable feast. This year we had Christmas bunting made by the ladies at the nursing home where Anne goes to knit with her mother-in-law. Anne had the ladies knit the flags. Then Anne had to block each flag and duplicate stitch the letters on - a mammoth effort. But Anne it was well worth it. The bunting was fantastic. Finally, I'd like to say that at our final meeting of the year we were able to present our lovely Thelma with life membership to the Epping group of the Knitters' Guild. Thelma brings a lot of joy to our group. She makes the most exquisite booties, hats and jackets for premature babies, and has done so for many, many years. We had no guest speaker this month because of the AGM. Welcome to the new committee. Thank you to all who have taken on one of these positions. Don't forget to look at the calendar to see what events we have coming up. There is our final education day for the year on November 17, and of course our annual Christmas celebration on December 1. 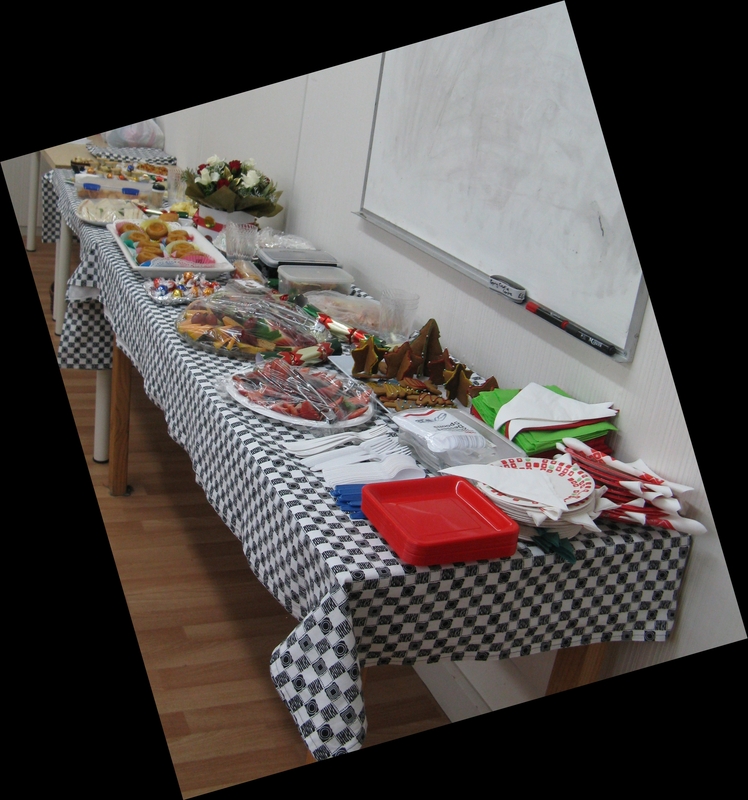 Due to the long weekend, our regular guest speaker and formal meeting was held on the second Monday in October. And it was definitely worth waiting for. Our guest speaker was Åsa Wahlquist on the natural dyeing of yarns. I was captivated by Åsa's presentation. The beautiful orange colours that can be achieved with ironbark leaves were amazing. I'm now intrigued to know what colour the leaves of an Angophora Costata (Sydney Red Gum) produce. Angophora's are closely related to Eucalyptus, and they are one of my favourite Sydney trees. 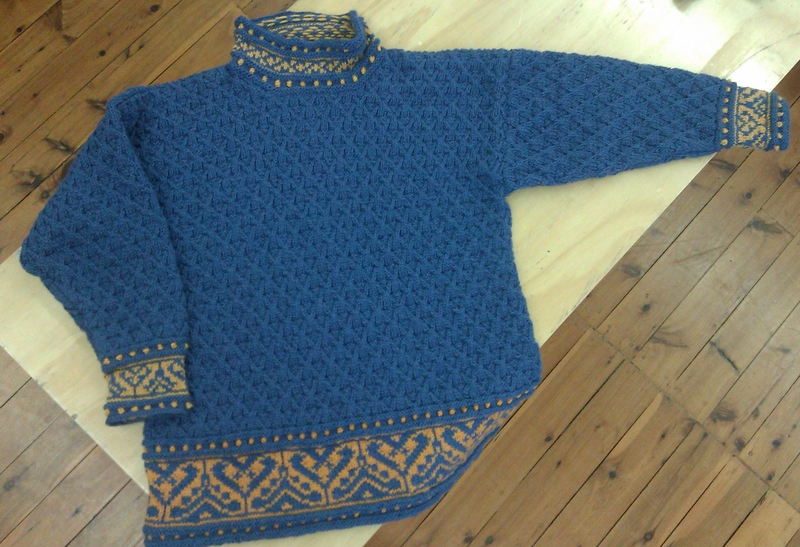 You can find Åsa on Ravelry - her user name is AsaW - to read more about her and see some of her work. Hopefully I'll get some photos to put on here soon. Our guest speaker today was the very talented and knowledgeable Val Quarmby. Val presented an more in depth look at the work of three designers of "modular" garments. The first was Tom Moore, from Australia. 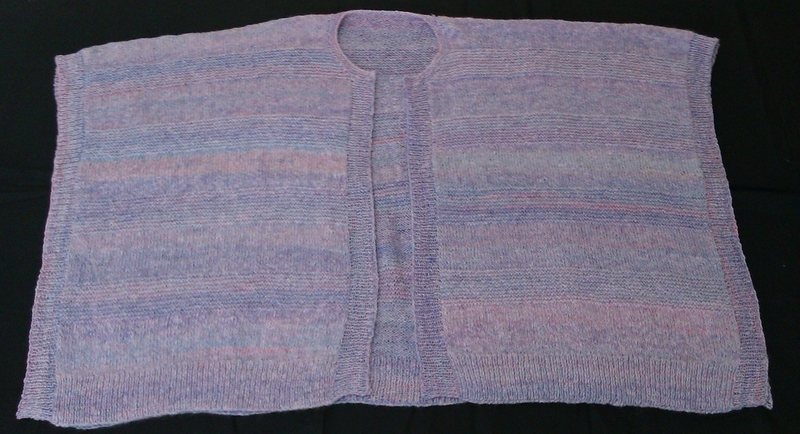 The original design was based on a number of knitted squares stitched together, but like many knitters, Val said she would prefer to knit rather than sew. So Val studied Tom's design and worked out a way to knit all the pieces together, starting with the central square, picking up stitches for the next square. All cutting and stitching couldn't be avoided, and the neck opening had to be stitched and cut. 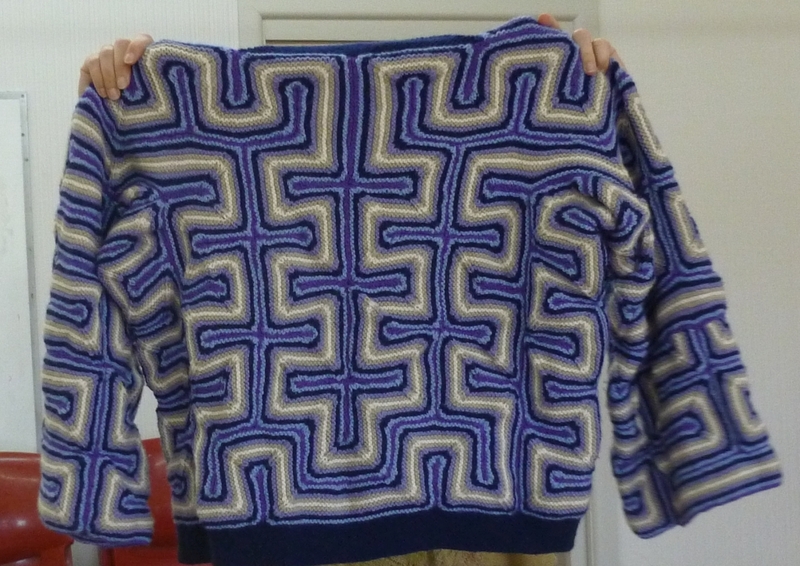 The second designer that Val talked about was Horst Schulz and patchwork knitting. 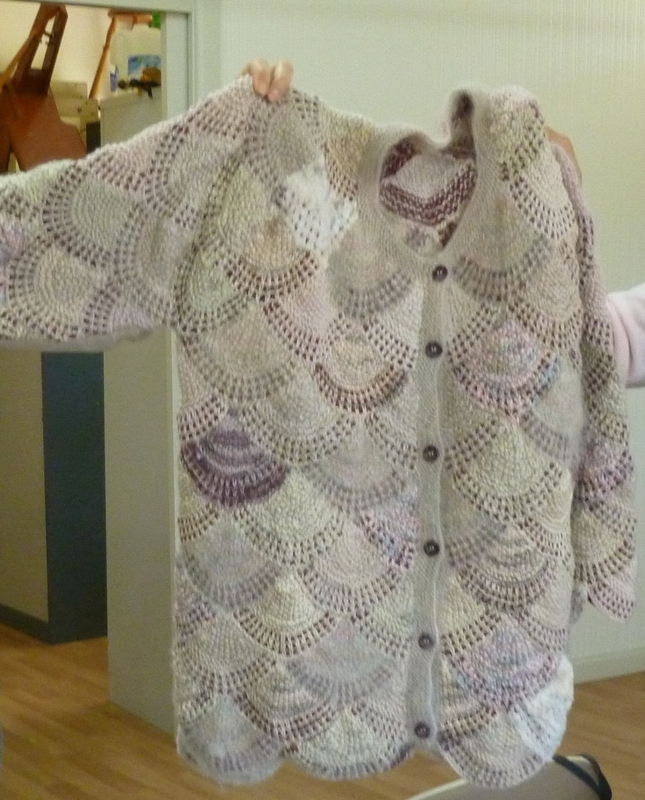 Val showed us a a cardigan she had made from shell shapes and different fibres. Val also mentioned Vivian Hoxbro (Domino Knitting) and Patricia Werner (Dazzling Knits) who also design garments based on this modular style of knitting. The final designer was Debbie New and labyrinth/maze knitting. This technique requires casting on lots of stitches, but then only having to work about 5cm, but with all the increases and decreases in the right spot. This strip then folds in on itself to make a cardigan! This style of garment construction requires lots of stitching though. Val had two garments to show us - a child's cardigan that required about 1600 stitches to be cast on and took about 8 hours to cast on. Val said she had to be meticulous with placing markers to show where increases and decreases needed to be worked. 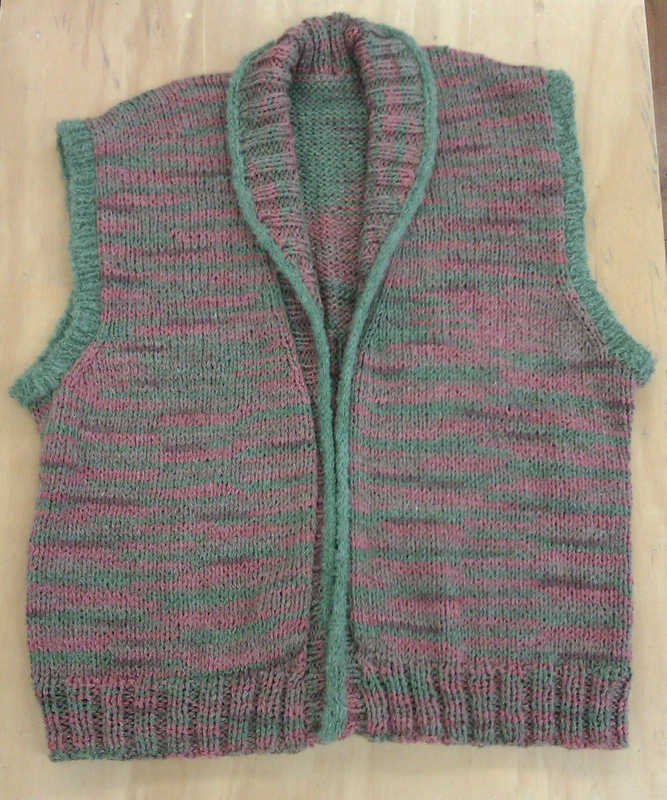 Val cast on over 4000 stitches for the adult cardigan. Not only was the knitting impressive but also the planning and diagrams that Val did for each of them, especially for the labyrinth cardigans. Normally at our formal meeting we have a guest speaker, but this month we did something different. Recently we had been donated a reasonable amount of very nice yarn. Donations like this are usually distributed amongst our members to use as they wish, but it was suggested that we instead auction this yarn to raise funds to give to charity. This met with general approval, though we first removed all the yarn suitable for making teddies to give to Jacqui who is our prolific maker of teddies for Westmead hospital. The auction was a roaring success with $295 being raised, which the group decided to donate to Stewart House. Many of our members knit items for charity. 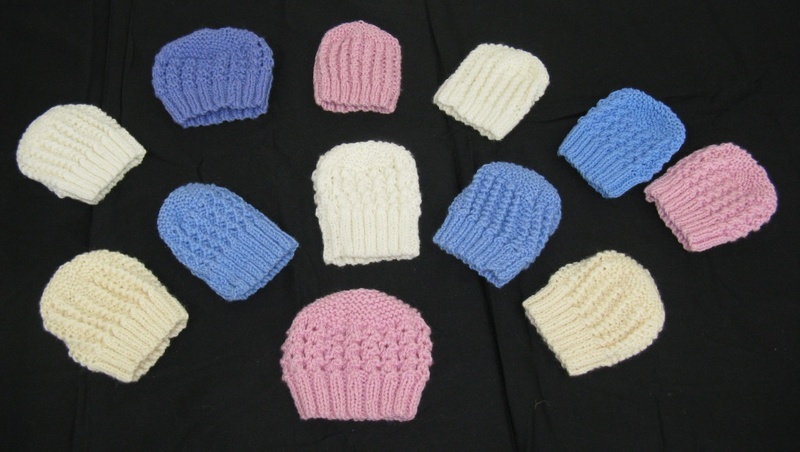 Eleanor has been busy recently making hats for premature babies. This were so small and gorgeous. 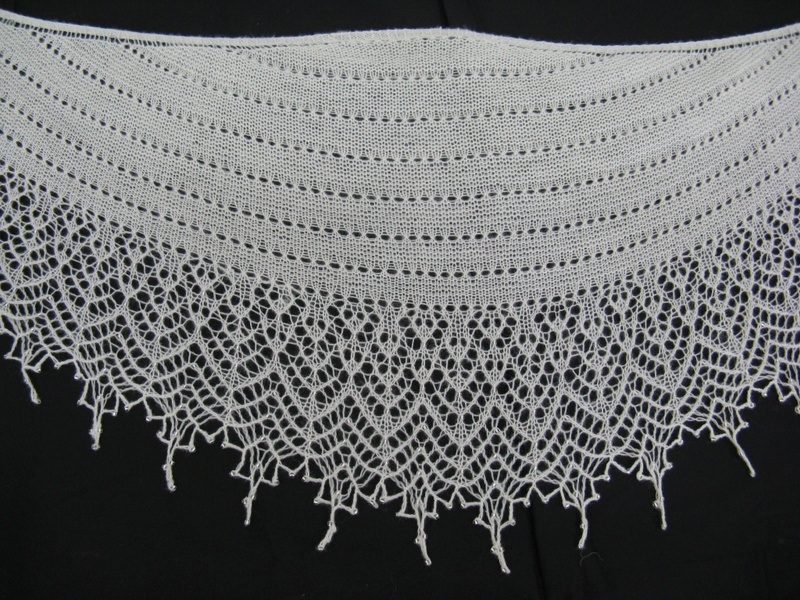 And Maree is a prolific, and very talented, knitter of lace shawls. This is Maree's first attempt at using beads. Our next formal meeting is on Monday September 1, and our guest speaker will be Val Quarmby.